I've been aware of Lorna Simpson's The Water Bearer for some time, but I saw it 'in person' as it were, in Newcastle this June. Once seen, it isn't forgotten, even in a room of works by the same artist, in a similar style. But what about the interpretation? What I really like about this piece is that you can 'get it' with a minimum of context, but the more you know, the more it gives. I found the title and caption had strong but rather imprecise associations. The title reminded me of the star-sign Aquarius and the importance (and danger) of fetching water in the European folk cultures I grew up with. I thought there might be something in the Bible. I couldn't pin it down to anything precise, but I got the general message: something bad happened by a river and the black female witness's testimony was discounted. I hadn't seen this discounting of black testimony as the central problem of racism in the American justice system today, but I was aware it was a problem. I remember the way the witness in the Trayon Martin case was treated and how her appearance and accent were used to dismiss what she had to say. 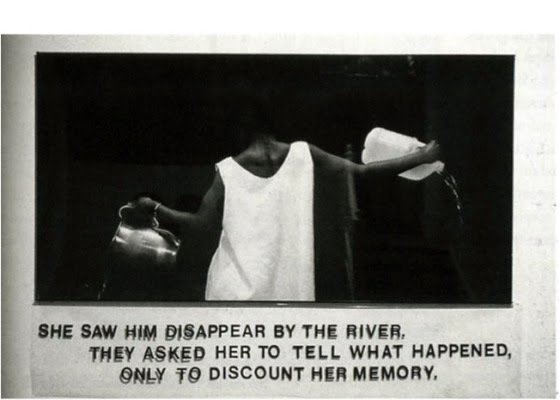 I thought Lorna Simpson's photograph might relate to a specific incident in American affairs which I wasn't aware of. This American reviewer is also vague on the classical context of the piece but she associated water bearing with labor, the lion's share of which she recognized as being done by African-Americans in her culture. So she also ended up 'getting the message' in a broad sense. The frightened deer, in terror, and a hare was a good prize. He himself was the bloodstained victim of that Libyan beast. It won them the heavens: Hyas gave them his name. In the 1980s Simpson made several pieces about the vulnerability of black men to violence, often from individuals or a society which claims it's defending itself. The theme could hardly be more current in 2014. The Aquarius myth says Hyas was torn apart by wild animals and his sisters grieved for him which earned them a place as the star cluster called the Hyades. The Water Bearer feels like a very grieving kind of piece, in a way that's both cathartic and limited. In Ancient Greek culture, mourning was one of the few public roles allowed to women. The Hyas myth and its original social context feed into the meaning of the piece in quite poignant ways. African American culture (including expressions of grief or anger at injustices) is influential on an international scale but actual social and economic justice and equality seem to advance at snail's pace. I gather some viewers automatically associate The Water Bearer with the figure of Justice. I didn't, but the guide at Newcastle drew my attention to the resemblance, and she'd apparently had it straight from Lorna Simpson a few days earlier. Once she'd pointed it out to me, it did seem kind of obvious. Here again, The Water Bearer can derive a lot of reliable meaning from comparison with a familiar archetype. Every detail - the black woman with her back to us, instead of a white woman facing us (sometimes blindfolded), the simple dress instead of the classical drapery, the lack of a weapon - is up for interpretative grabs. Most importantly, nobody could miss the allegation of injustice, and almost anyone will respond to that. I thought the iconic qualities of The Water Bearer and its many layers of meaning were as rewarding as they were unforgettable. Not that I'd failed to notice the string of current affairs incidents and statistics revealing racial inequalities in law enforcement and justice, but The Water Bearer pulls them together and focuses them in the way art should.